Central Taupo Townhouse offers accommodation in Taupo, 24 km from Orakei Korako - The Hidden Valley and 700 metres from Taupo Bungy. The property is 1.1 km from Lake Taupo Hole in One Challenge and a 14-minute walk from Wairakei Natural Thermal Valley. This holiday home has 2 bedrooms, a kitchen with a dishwasher and an oven, a flat-screen TV, a seating area and a bathroom. The holiday home offers a barbecue. Central Taupo Townhouse offers a sun terrace. Great Lake Convention Centre is a 15-minute walk from the accommodation. 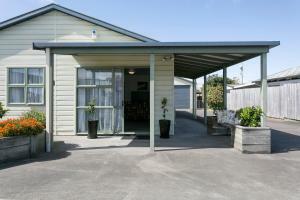 The nearest airport is Taupo Airport, 6 km from Central Taupo Townhouse. When would you like to stay at Central Taupo Townhouse ? This holiday home has a dining area, flat-screen TV and stovetop. This property will not accommodate hen, stag or similar parties. Please inform Central Taupo Townhouse in advance of your expected arrival time. You can use the Special Requests box when booking, or contact the property directly with the contact details provided in your confirmation. Payment before arrival via bank transfer is required. The property will contact you after you book to provide instructions. Each day we'll check prices and send you an email for your selected dates at Central Taupo Townhouse. If you don't have specific dates but would like to check prices for say next weekend or say next month we can check the price too. Click to write a review and share your experience of Central Taupo Townhouse with other travellers.